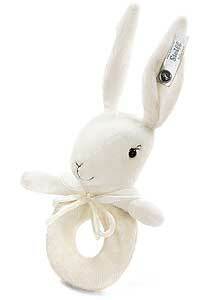 Steiff Rabbit Grip Toy from the Premier Selection. Ultra soft exclusive gifts for children, safe from birth. Made from cuddly soft plush for baby soft skin, together with knitting accessories made from the finest sand cashmere blend. Safety eyes, Silver-coloured Button in Ear. Machine washable, Size 13cm (approx. 6 inches). with rattle, Complies with Okeo-Tex 100 standard. Supplied in luxury gift presentation box.